"You ain't a bad lookin' man, Mr. Garrison.."
If there's one thing Browns' fans have learned during this free agency period, it's that you can't call GM Tom Heckert a liar. Heckert said last week that the franchise would not make a big splash in the market. The NFL's high-priced free agent bazaar opened on Tuesday at 4 p.m., and true to their word, the Browns weren't waiting to rush inside with checkbook in hand. It seems the Browns are sticking to their plan, whatever that may be. The team certainly isn't sharing trade secrets with the public. However, one can surmise by the last two off-seasons of inactivity that the Browns are trying to build almost exclusively through the draft. With so many holes to fill, grabbing a good-if-not-spectacular player off the wire won't make enough of a difference to be worth the cap space. Or so the theory goes. But with the Browns pushing back from the NFL's springtime smorgasbord, the cringe-inducing terms "patience" and "process" have been making the media rounds. Agonized Browns' backers don't want to hear it. We have been up to our necks in Cleveland-football spin doctoring since the team came back to town in 1999. People are beyond weary. Rows of empty orange seats at the stadium last year told the tale well. The backlash against the club has been unprecedented in my time as a fan. Yes, that's partially due to the Internet and sports radio giving everyone with electricity a stage on which to gripe, but there's no doubt Browns' nation is a race car running in the red. And as everyone knows, it's dangerous to have a race car in the red. The new regime, like each one before it going back to Policy/Clark, is paying for the mistakes of past incompetence. The problem is, we are in Year No. 3 of Holmgren & Heckert, and nobody really knows if these guys are right for the job, either. Our patience is frayed to the breaking point. We want the "process" to move a little faster than its current brontosaurus pace. Obviously, the front office has other plans. The lack of urgency is frustrating, though. Besides drafting Greg Little, the Browns did nothing to shore up a terrible wide receiver corps last year, impeding whatever progress Colt McCoy could have made within the offense. Veteran wideout help has already largely gone by the boards this off-season as well - it's one thing to throw ridiculous cash at a "nice" player like Pierre Garcon, it's another not to show any interest in even one or two impact players, at any needful position, that could move this cart full of boulders up the hill just a wee bit faster. It's not alarmist to be aghast at the disinterest the Browns seem to be conveying in constructing a winner. Sure, great teams build through the draft and add complimentary free agents. The Redskins have paid out the nose for FAs over the years and have won exactly nothing. The Browns splurged a few times themselves, only to be crushed by damnable injury luck and poor chemistry. But to count on hitting home runs on multiple draft picks, as the Browns appear to be doing, is stretching the old-school team-building philosophy mightily. Drafts usually take three years to come to fruition. Does this regime even have three years? Pat Shurmur certainly doesn't. Another 4-12 season and Mr. Personality will likely be booted from Berea. That means a new coach, a new philosophy and about a million shots of Gentleman Jack to ease the grinding ache of it all. The nebulous nature of the Browns' plans is perhaps its most disturbing aspect of the last few days. There's no entry point for fans to grasp onto. This leads to confusion, with the inevitable stops at anger, hate and eventually the Dark Side, about two hours east in a place where cretins drink Iron City Beer and wave hand towels outdoors. Anyone insane enough to stick by the brown-and-orange can recognize the gaps in the roster - receiver, running back, quarterback, offensive line, linebacker and cornerback. 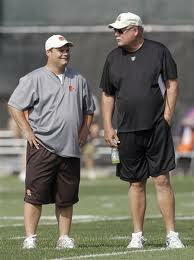 We just better hope that Heckert and Holmgren are the smartest men in the room come late April. Otherwise, we may be having this conversation again at the same time next year.